WEEEE!! The big slide was FUN! 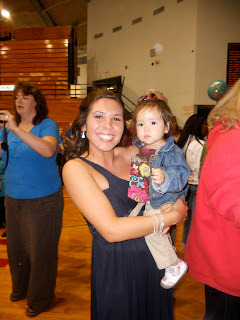 Even though she didn't win Homecoming Queen, she'll always be a queen to her niece. We love you Auntie Brooklyn!! Loves singing and doing the "Itsy Bitsy Spider"
We've been enjoying this BEAUTIFUL weather and it's been a busy start to the Fall season so far! Sophia and I are both getting fully adjusted to our new routines, and like the title states- new beginnings! Today, we all woke up early and headed to church and then to Iowa Machine Shed for breakfast. Sophia seemed tired so we headed home and put her down for a nap. After Sophia woke up we decided to go to Center Grove Orchard and take advantage of the weather while it was here. We had a BLAST- we did the corn pool, animals, hayride to pumpkin patch, straw maze, big slide, and pillow jump. Sophia loved it- she got a little grouchy towards the end and when we were on the ride back from the pumpkin patch she threw a mini fit because we wouldn't let her get up and walk around. My work is going really well- I'm really getting adjusted to everything and got offered a part time job- I don't know specific details as it was just brought to me Friday but I am very excited nonetheless as it will be a great way for me to get my foot in the door. Next week the counselor I work with is going on vacation so I am taking on her clients and so it will be good experience to see what it is really like, with a full case load and doing all the paperwork. I also began working with a family through Iowa Family Services, a respite services provider. I work with three boys who have different diagnoses (mental health) and I love it! I really enjoy the boys and it will be great to start doing some one on one things with each of them. I work with the boys twice a week so it's a not too much with Will's classes and everything else going on. Overall, we've had a great start to October, with a few busy weekends coming up- Lansing next weekend, and then Halloween festivities coming up in the next few weekends too!